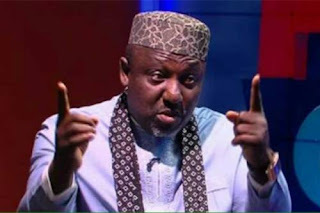 Governor Rochas Okorocha of Imo State has been accused of engaging young Hausa men for the thumb-printing of ballot papers ahead of Saturday’s presidential and National Assembly elections. This allegation came from Osita Izunaso, who is the senatorial candidate of the All Progressives Grand Alliance, APGA for Imo West senatorial district, the same district being contested by Governor Okorocha on the All Progressives Congress, APC, platform. Izunaso made the allegation through his legal adviser, Prince Orji Nwafor-Orizu, yesterday at a press conference, in Owerri. According to Nwafor-Orizu, his client, being a law abiding citizen, has decided to alert the general public on the alleged ongoing thumb-printing of ballot papers, at the Spibat Residence of Governor Okorocha, who is also the senatorial candidate of the APC in the election. He said that the Resident Electoral Commissioner, REC, of Imo State, the police and the Department of State Services (DSS) have all been notified of the incident. He added, “We have evidence from one of the security guards, who is an Hausa man, who has been away since last Saturday, and later called to tell his boss, who is a member of our campaign team that they were at Spibat, where they have been paid to thumb-print ballot papers and that is still ongoing as we speak. However, in a swift reaction, Okorocha described the allegation as frivolous. He said Izunaso is not only a frustrated man, but one of the most unpopular and colourless politicians in the state. In a statement by his Chief Press Secretary, Sam Onwuemeodo, Okorocha said, “Rochas Okorocha won elections in 2011 and 2015, respectively, through the ballot papers. Osita Izunaso is one of the most unpopular and colourless politicians in the State. “And he is not an attractive politician to any voter in the State. Governor Okorocha has campaigned in the 12 local governments of Orlu zone.